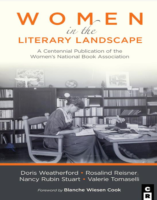 The Women’s National Book Association is pleased to announce the 2019 WNBA Pannell Award award winner in two categories: General Bookstore and Children’s Bookstore. This year’s winners were chosen by a committee of publishing professionals, including Amanda Barillas, field sales children’s specialist at Macmillan; Brenda Bowen, literary agent at Sanford J. Greenburger Associates; Bernette Ford, founder of Color-Bridge Books; Emily Romero, senior v-p of marketing at Penguin Young Readers; and Phoebe W. Yeh, v-p and publisher at Crown Books for Young Readers. The winning stores will each receive a check for $1,000 and a signed work of original art from a children’s book illustrator. 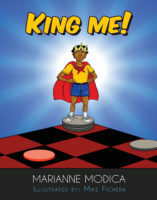 The awards will be presented at the BookExpo Children’s Book and Author Breakfast on May 31 in New York City. Along with the WNBA, Penguin Young Readers Group co-sponsors the award, which was established in honor of Lucille Micheels Pannell, founding member of the Chicago chapter of the WNBA organization. Pannell was a well-known librarian, author, and manager of the Hobby Horse Bookshop at Carson, Pirie, Scott, and Company department store in Chicago. 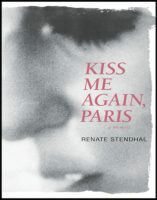 Pannell also founded the Chicago Children’s Reading Table and was the first bookseller to win the WNBA Award in 1949. 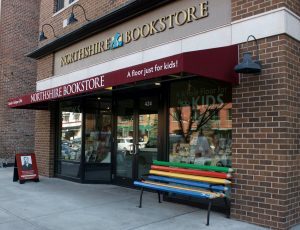 Northshire Bookstore, Saratoga Springs, N.Y. 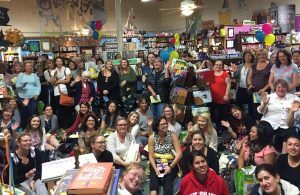 The Women’s National Book Association is pleased to announce the 2017 WNBA Pannell Award winners for bookstores. Jurors cited The Bookworm of Edwards’ passion, and connection with their community, and inventiveness, as shown in their adopt-a-reader program that provide books for children in need; free book talk services for their school district that makes them a critical resource to school media specialists and educators; and their annual writing contest and book publication program. Jurors noted their commitment to carrying a diverse selection of titles and the way Children’s Book World embodies the idea of a bookstore as a place of discovery, citing their quarterly poetry slam for readers ages 8-13; their Teen Readers Council; and the “Readers & Writers Rock!” program through which they bring authors to low-income schools and underserved children. 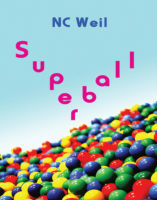 Since 1983, the Women’s National Book Association (WNBA) has awarded one of the most prestigious honors in children’s bookselling. 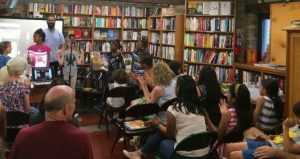 Along with WNBA, Penguin Young Readers Group co-sponsors the Pannell Award which recognizes bookstores that enhance their communities by bringing exceptional creativity to foster a love of reading. Given annually at BookExpo America’s Children’s Book and Author Breakfast, the winning stores each receive a check for $1,000 and a piece of original art from a children’s book illustrator. Every year a committee of publishing professionals selects two Pannell Award recipients—one general bookstore and one children’s specialty bookstore. 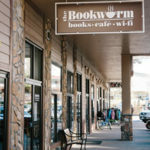 Store nominations come from customers, sales reps, store personnel, or anyone who has been impressed with the work of a particular independent bookstore. The WNBA Pannell Award chair is Susan Knopf, founder and president of Scout Books & Media Inc. In 1981, the WNBA established the WNBA Pannell Awards to recognize and publicly applaud the work of booksellers who stimulate, promote and encourage children’s and young people’s interest in books. Lucile Micheels Pannell, a founding member of one of the WNBA chapters, was born in the late 1800s. A model bookwoman, her career included teaching in a one-room schoolhouse, working as a librarian, then managing the Hobby Horse Bookshop in Chicago’s Carson Pirie Scott department store from 1943 to 1953. Although she had no children of her own, Lucile loved reading to children and introducing them to the world of books. Chicago schools would sponsor field trips to the Hobby Horse Bookshop because children and teachers loved visiting with Lucile to listen to stories and learn about the world of books. This Award is our way to honor Lucile’s special role in WNBA’s history. Every year a panel of publishing professionals selects two winners of the award—one a general bookstore and one a children’s specialty bookstore. 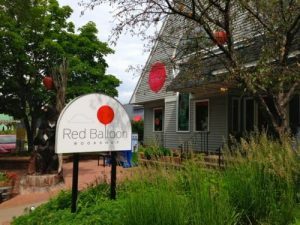 The store nominations come from customers, sales reps, store personnel, or anyone who has been impressed with the work of a particular independent bookstore.